"All spice" redirects here. For all spices, see List of culinary herbs and spices. Allspice, also called pimento,[a] Jamaica pimento, Jamaica pepper, pimenta, or myrtle pepper, is the dried unripe fruit (berries, used as a spice) of Pimenta dioica, a midcanopy tree native to the Greater Antilles, southern Mexico, and Central America, now cultivated in many warm parts of the world. The name "allspice" was coined as early as 1621 by the English, who thought it combined the flavour of cinnamon, nutmeg and cloves. Evanesca crassifolia Raf. nom. illeg. Myrtus aromatica Poir. nom. illeg. Myrtus aromatica Salisb. nom. illeg. Myrtus piperita Sessé & Moc. Pimenta aromatica Kostel. nom. illeg. Pimenta communis Benth. & Hook.f. 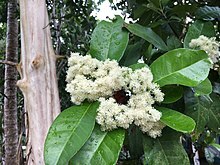 Pimenta pimenta (L.) H.Karst. nom. inval. Pimentus aromatica Raf. nom. illeg. Pimentus vera Raf. nom. illeg. Several unrelated fragrant shrubs are called "Carolina allspice" (Calycanthus floridus), "Japanese allspice" (Chimonanthus praecox), or "wild allspice" (Lindera benzoin). "Allspice" is also sometimes used to refer to the herb costmary (Tanacetum balsamita). Allspice is the dried fruit of the Pimenta dioica plant. The fruits are picked when green and unripe and are traditionally dried in the sun. When dry they are brown and resemble large, smooth peppercorns. Fresh leaves are similar in texture to bay leaves and similarly used in cooking. Leaves and wood are often used for smoking meats where allspice is a local crop. Care must be taken during drying to ensure that volatile oil, such as eugenol, remains in the end products. In the United States, it is used mostly in desserts, but it is also responsible for giving Cincinnati-style chili its distinctive aroma and flavor. Allspice is commonly used in Great Britain, and appears in many dishes, including cakes and also in beauty products. In Poland, allspice is used in a variety of dishes, including savory foods like deli meats, soups, marinades and pickles, and to a lesser extent in desserts and fruit drinks. Even in many countries where allspice is not very popular in the household, as in Germany, it is used in large amounts by commercial sausage makers. 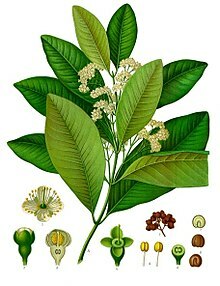 Allspice (P. dioica) was encountered by Christopher Columbus on the island of Jamaica during his second voyage to the New World, and named by Diego Álvarez Chanca. It was introduced into European and Mediterranean cuisines in the 16th century. It continued to be grown primarily in Jamaica, though a few other Central American countries produced allspice in comparatively small quantities. ^ a b Not to be confused with pimento, a red, heart-shaped sweet pepper. ^ "The Plant List: A Working List of All Plant Species". Retrieved 19 August 2015. ^ Riffle, Robert L. (1 August 1998). The Tropical Look: An Encyclopedia of Dramatic Landscape Plants. Timber Press. ISBN 978-0-88192-422-0. ^ Oxford English Dictionary (2 ed.). Oxford, UK: Clarendon Press. 1 March 1989. ISBN 978-0-19-861186-8. Retrieved 12 December 2009. ^ Branch, Legislative Services. "Consolidated federal laws of canada, Food and Drug Regulations". laws.justice.gc.ca. Retrieved 19 July 2018. ^ Lorence, David H.; Flynn, Timothy W.; Wagner, Warren L. (1 March 1995). "Contributions to the Flora of Hawai'i III" (PDF). Bishop Museum Occasional Papers. 41: 19–58. ISSN 0893-1348. Retrieved 12 December 2009. ^ Nancy Gaifyllia. "About.com Greek Food – Allspice". Archived from the original on 7 July 2011. Retrieved 26 June 2011. "Pimenta dioica". Floridata Plant Encyclopedia. "Pimenta dioica". Plants of Hawaii. Hawaiian Ecosystems at Risk project (HEAR). "Allspice". Gernot Katzer's Spice Pages. "Allspice". The Encyclopedia of Spices. Epicentre.com.